What is a Bone Dry Cappuccino? Two out of three people are c﻿﻿off﻿﻿ee lovers and if you are reading this, then you are probably one of them too. However, not everyone likes to have their coffee the same way. They have their own brewing preferences, different tastes – basically, a cup of coffee is a direct representative of their personality. And for some people, a “bone dry cappuccino” is the perfect beverage. But what exactly is a bone dry cappuccino? "Bone dry" means no steamed milk at all–just a foam pillow and espresso. A super wet cappuccino is a latte. Before diving into the bone dry matters, we need to make some things clear: there’s coffee, and then there’s espresso. Coffee is obtained by using hot water and ground coffee. Espresso, on the other hand, is a strong coffee that is obtained by forcing steam through the coffee grounds. The result will be a very concentrated coffee that can be mixed with other ingredients. To put it simply, espresso is to coffee what orange essence is to orange juice. According to baristas, a cappuccino is one-third espresso, one-third milk, and one-third foam. However, since people and their taste in cappuccino kept changing, we also developed two different types of cappuccino. 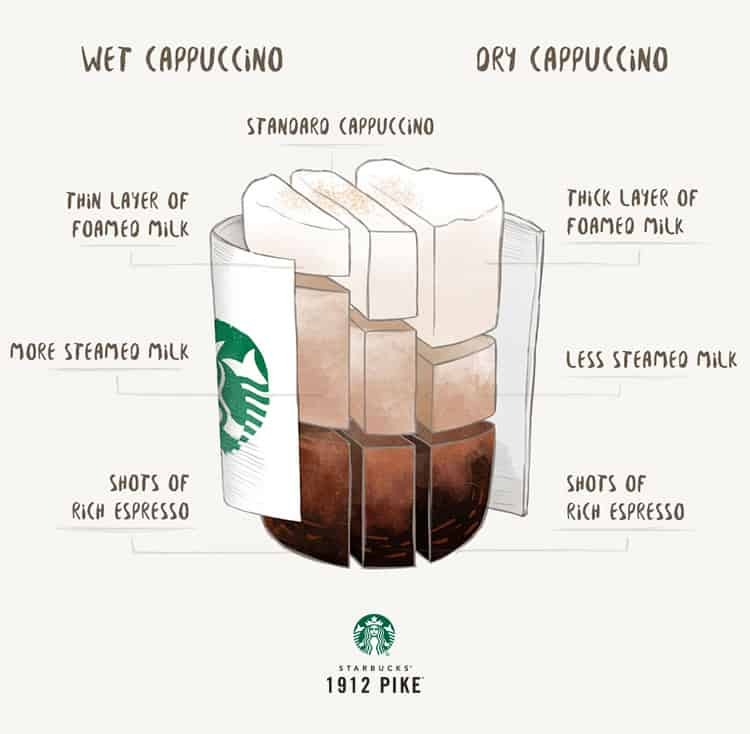 Therefore, we now have wet cappuccino and dry cappuccino. A regular “wet” cappuccino is the one we described above: milk, foam, and espresso. On the other hand, a bone dry cappuccino is one that has espresso as a base, plenty of foam, and little to no milk. There are several reasons why many people prefer foam over milk. Some say that the foam on top will allow the coffee to stay hot for a longer time. Others say that the foam is a perfect canvas for making latte art. On the other hand, others believe it just helps the cappuccino stay together. Regardless of the reason, more and more people ask baristas for bone dry cappuccinos. As a coffee lover, you are no longer required to go to a nice café just to enjoy a cappuccino. As long as you have a good coffee machine and the right ingredients, you can make your own “bone dry” in the comfort of your home. The first step is to take a cup of milk, pour it into a saucepan, and allow it to simmer at low heat until you start seeing bubbles forming at the sides. Be careful not to let it go into boil; the saucepan needs to be taken away from the heat the moment you see the first bubbles forming. Once the milk has been heated, you can start whipping it with a whisk or a mixer. When you see the foam beginning to appear, you can start increasing the speed to encourage the formation of more foam. Once you see it has enough volume, you set the foam aside. Start preparing the espresso. Measure the coffee grounds and make sure that you have 6 ounces of water per 2 tablespoons of coffee. Using your coffee machine, you may start brewing the ground coffee. You can go for a French press, an automatic drip or an espresso machine. Once you have the espresso brewed, you are ready to prepare the bone dry cappuccino. A bone dry cappuccino doesn’t need any milk. What it does need is a lot of foam and some espresso coffee. Grab a mug, fill it with 2/3 of coffee and then top it with 1/3 foam. With this, your bone dry cappuccino is ready to be served together with your favorite snacks. We advise that you learn more about brewing different types of coffee because let’s be honest: every coffee lover should know how a bone dry cappuccino is done. Hopefully, this article will have pricked your barista skills – or at least make you feel more confident when you are ordering from the café. So, do you still like your coffee wet, or do you want a dry one now?